If there ever was a real-life, flesh and blood superhero, it would be Santo — The Saint — the greatest luchadore of them all. In a phenomenal career spanning five decades, dominating the ring and starring in comic books and movies, Santo came to be revered as a folk hero in Mexico. In his fifty movies, Santo fought rudo wrestlers, diamond smugglers, evil crime lords, Nazis, mafiosi, and an inordinate number of mad scientists, bringing every one of them to inevitable justice or fateful doom. 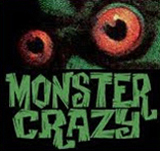 Along the way, he grappled with a veritable encyclopedia of monsters, including zombies, mummies, vampire women, automatons, werewolves, an abominable snowman, a cyclops, Martians and witches. He even mixed it up with Frankenstein a few times. 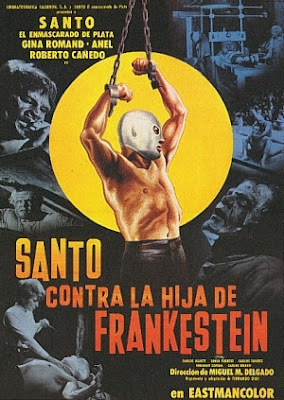 1971’s Santo vs la hija de Frankestein (note the spelling), was a slick Eastmancolor entry, with atmospheric dungeon sets, a fog-bound cemetery, and a gogo-age lab. The film’s greatest asset is Cuban-born actress Gina Romand, who steals the picture as the commanding Freda, Frankenstein’s daughter, cooking up ugly monsters and bossing her muscle-bound henchmen around. Romand was a reliable featured player in a long list of Mexican B’s, appearing with the legendary Cantinflas in Agente XU 777 (1963), and playing opposite several luchadores enmascarados including the black-masked Neutron, the caped Rocambole, and Karloff Lagarde, aka The Angel. 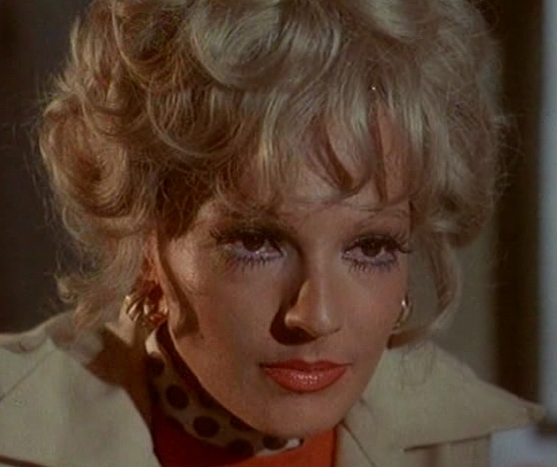 Romand graced several Santo pictures, notably as a vampire queen in La venganza de las mujeres vampiro (1970). Freda Frankenstein’s particular predicament is a need to self-inject increasingly powerful doses of a painful drug that staves off her extreme old age. Having determined that the stalwart Santo’s blood would improve the youth serum, she has her men kidnap Santo’s girlfriend, drawing the hero into a trap. With the oiled Santo helplessly hanging from chains, the wicked Freda can’t help removing his mask — his back is to the camera, of course — forcing a passionate kiss on the helpless hero, and then slapping his face. Santo eventually escapes, only to mix it up lucha libre style with Freda’s burly, box-headed Monster, Ursus, in a moody, moonlit cemetery, taking flying leaps off tombstones. After the creature is cruelly impaled on a cast iron cross, Santo shows heroic compassion, literally giving The Monster the shirt off his back, using it to plug the bloody, gruesome wound in its chest. King-size wrestler/actor Gerardo Zepeda does double monster duty, appearing as Frankenstein’s Monster, Ursus, and the ape-faced zombie, Truxon. Since 1963, Zepeda, sometimes billed as Chiquilin, has impressively clocked in over 130 film appearances playing hulking henchmen, brawling mutants and jumbo-sized bandits. In the end, its perspective changed by Santo’s kindness, The Monster turns on its maker, snapping her neck. In death, Freda turns into a bushy-wigged, wrinkle-faced mummy. Blinded by acid, The Monster stumbles into the laboratory’s requisite destructo-switch and the joint blows up. Santo is a brave, honest, even-handed hero, a sort of discount Superman, with a touch of cool James Bond élan, and the sensibilities of Smokey The Bear. Whether powerbombing opponents to the mat, or putting sweaty headlocks on movie villains, the barrel-chested Santo wore spandex tights, tall boots and a signature silver mask. Off the job, he favored sports coats and turtlenecks, and tooled around in a convertible. His monster-mash adventures channel the spirit of the classic Universal horror movies, conjugated with the impulsive energy of the brawls and broken furniture school of old Republic serials. Santo vs la hija de Frankestein is your typically Santo outing, goofy and entertaining, though this one is cranked up a full notch by Gina Romand's lively performance. A list of all the Santo films, with entertainingly-written synopsis, complete cast and credits, and a sampling of posters and lobby cards. A survey of Santo films on Search My Trash. I have an original lobby card from this film, found it at a comic convention in a bin of discarded 50 cent items. I couldn't believe it. Same bin had an original one sheet of Corman's Tomb of Ligeia too... total score that day thanks to a carelessly uninformed seller. 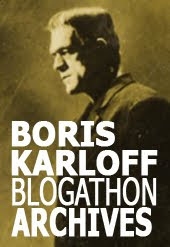 Better than its inspiration, "Jesse James Meets Frankenstein's Daughter." As Dread said, another great post! I have as complete a collection of Santo movies on DVD as is possible, obtained through UK, US and of course Mexican sources. The ultimate monster fighter.